Without a big keynote, Apple today announced the long expected update of its MacBook Pro line. The 2018 MacBook Pro models are a refresh of the existing designs with new CPUs , GPUs, more RAM and bigger batteries. Apple often celebrates the announcement of new products with long key-notes that are live-streamed world-wide. But sometimes, a product release doesn't warrant such a big show. The new MacBook Pro models, which Apple announced today via a simple press-release, are such a case. The 2018 update of the MacBook Pro line was long overdue, since the competitors in the PC space already updated their lineups with new CPUs months ago. Apple's perceived negligence in updating its Mac-products regularly results in criticism from its long time fans and the press. At least for MacBook Pro users, the wait for new products is over now, although the 2018 release of the MacBook Pro 13 and 15 might let down some Mac-fans with high-expectations. The design of the MacBooks stays the same, which means that Apple still uses the controversial keyboard with its delicate Butterfly mechanism and Touchbar – although Apple does say that they have reduced the noise of the "3rd gen Butterfly" switches. There are also no changes to the ports, which still consist of four Thunderbolt 3 ports and a 3.5mm headphone-jack. The main focus of this refresh is on the internals, as Apple finally moves to the 8th Gen of the Intel Core i CPUs, which means that the MacBook Pro 13 will now feature quad-core CPUs, while the MacBook Pro 15 moves to hexa-core chips like the Core i9-8950HK. The 15-inch model will now also be offered with up to 32 GB of DDR4 RAM, double the maximum amount of the older model – the 13-inch model however is still stuck with 16 GB of LPDDR3 RAM. On the GPU front, the 13-inch model gets an upgrade: Instead of the Intel Iris Plus 640, it will now feature the Intel Iris Plus 655. The MacBook Pro 15 will be powered by the AMD Radeon Pro 555X or AMD Radeon Pro 560X. The past two generations of MacBook Pro models were sometimes criticized for reduced battery runtimes compared with older models, as Apple used smaller batteries. With the 2018 models, Apple apparently tries to remedy that, as the new models feature bigger batteries with 58 Wh of battery capacity on the MacBook Pro 13 and 83 Wh on the MacBook Pro 15. Apart from the new CPUs, bigger batteries are no doubt the biggest upgrade for this year. There are also some smaller new features. The Retina displays now feature "TrueTone" technology and both MacBook Pro 2018 models include the Apple T2 security chip for enhanced security. The feature "Hey Siri" is also available on the MacBook Pro for the first time. 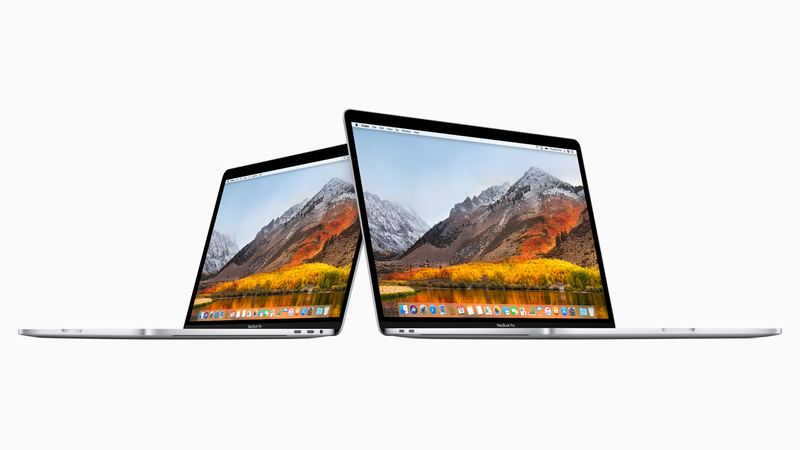 The new MacBook Pro 2018 models are available now, with prices starting at 1,799 US-Dollar for the 13-inch and 2,399 Dollar for the 15-inch model. Not updated today are the MacBook Air, 12-inch MacBook and the 13-inch MacBook Pro without the Touchbar – those models all still use older CPUs.